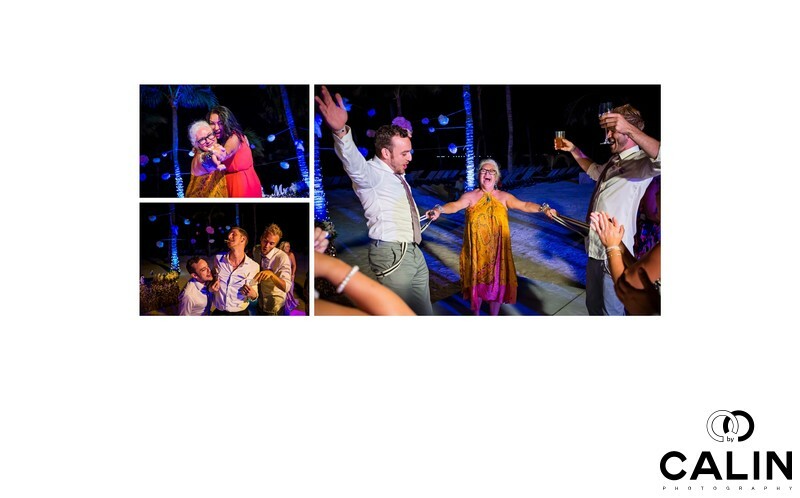 The wedding reception at Barcelo Maya Palace Deluxe was lively and enjoyable. This album spread fully reflects the fun atmosphere of the wedding reception. The image on the left portrays the mother of the groom and her daughter-in-law dancing and posing for the camera. There are obviously enjoying themselves and having a great time. For this image to isolate the subject, I lowered my stance and shot against the sky and the blue lit palm trees. That unique vantage point and the genuine expressions makes this a compelling photo. The second picture on the left shows groomsmen having fun. One of them used to starfish to simulate a bra. The other two groomsmen are taking him, and all three of them are having a blast. The third and final picture on the spread shows the mother of the groom laughing hysterically while pulling the suspenders' of two of the groomsmen. It is a hilarious wedding picture that the bride and groom loved. From a technical standpoint these images are straightforward. Shots with my 35mm lands mounted on a Canon 5D Mark III camera. In all three of them, the scene was lit by one or more flashes to freeze the action in the photos. To make sure that everybody can focus I shot these pictures at F4 and use the technique called zone focusing. What is zone focusing? This is the street photography technique that I love to use in wedding photography. As a Toronto wedding photographer, I shoot in various situations, and many of them are not ideal. For example, wedding receptions are sometimes very dark, and my cameras struggle trying to focus. In such situations a pre-focus on an object with a high contrast (a candle for example). Next, I photograph my subjects at the same distance from the camera as a candle. This special technique allows me to ensure that subjects look sharp and every photo. Location: Carretera Chetumal - Puerto Juárez Km. 266.3, 77750 Solidaridad Riviera Maya, QROO, Mexico.